TRAILS IN YACHATS: Please see the brochure Yachats Trails to explore the meandering oceanfront 804 Trail, the public footpath in the private Gerdemann Botanic Preserve, and the Amanda Trail, which links Yachats to the top of Cape Perpetua. Several in-town loop walks are shown, including flatland walks and an upland cardio work-out loop. Some of these walks are also suitable for wheelchairs and strollers and others for bicycles. For an unforgettable beach walk, explore the 7-mile stretch of sandy beach between Yachats and Waldport around low tide. Build a sandcastle, fly a kite, take your shoes off in the surf. The Gerdemann Botanic Preserve This extraordinary private botanic preserve just north of town includes a public footpath, open during daylight hours. Additional trails, including a wheelchair accessible trail, may be toured by appointment, Thursday-Saturday, during blooming season. Alsea River Water Trail – printable guide. Drive-to Viewpoints within this 2,700 acre Scenic Area include (from N to S) Devil’s Churn, Cape Overlook, and Cook’s Chasm–look for signed turnouts on Hwy 101, 2 to 4 miles south of Yachats. Viewpoints are on the W side of the highway, except for the Cape Overlook. For the Overlook, turn east off Hwy 101 at the Cape Perpetua Campground exit, and take an immediate left up Overlook Road to the top of the mountain. Place your pass or day-use permit on the vehicle dash. This is the highest point you can drive to on the Oregon coast. Whether you watch from an oceanfront bubbling jacuzzi or from the howling wind dressed in full raingear, a coastal winter storm inspires awe for mother nature. at low tide following a storm. Discovery Loop QUEST – Approximate round trip time – 1.5 hours. are announced at Cape Perpetua throughout the year. In the fall, guided mushroom walks are offered. For the Yachats Village Mushroom Fest (held on the 3rd weekend in October), renowned mycologists and forest ecologists join Cape staff to lead more than 20 beginning through intermediate/advanced level mushroom walks. (FMI, please see Yachats Events). During June, July and August, Tidepool Discovery Days are scheduled to coincide with some of the lowest tides of the year. FMI, please call Cape Perpetua Visitors Center (541) 547-3289. Park Permits and Passports: the Pacific Coast Passport, NW Forest Pass, and Golden Passports are honored here and may be purchased in the Cape Perpetua Visitors Center. Without a pass, day-use permit is $5.00 per auto and includes use of the entire Scenic Area for one day. Learn about restoration and coastal temperate rain forest with Manager Paul Engelmeyer, (541)547-4227. Variable price for tour groups. Smelt Sands State Recreation Site and the 804 Trail: Attend a walk along the trail to learn the trail’s history and find native plants. The walk begins at Smelt Sands parking lot and heads north. Smelt Sands State Wayside is located one mile north of downtown on Hwy 101. This section of trail is wheelchair accessible. Yachats State Recreation Area: Come hear programs about the tide pools and the whales seen from the park’s Platform. 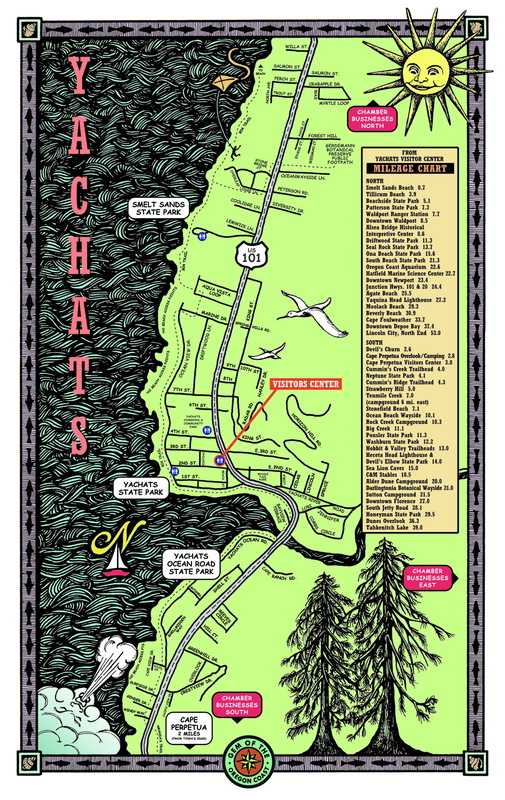 Find Yachats State Park at the west end of 2nd St in downtown Yachats. Strawberry Hill: Explore the amazing tide pools with the Roving Interpreter and hear about the Harbor Seal that are resting close by on the rocks. Find Strawberry Hill just 5 miles S of downtown Yachats on Hwy 101. Guided tours of this private preserve, which includes a wheelchair accessible trail, are available by appointment, Thursday-Saturday, during blooming season. Special tours and group visits can be arranged all year. Call (541)547-3416, (800) 551-6949. Hours of tours may vary depending upon weather and the availability of volunteers. Day use permit, $3 per vehicle, or show annual pass, or Oregon Coast Passport. Place your pass or day-use permit on vehicle dash. FMI, please see State Parks. Within a half-hour’s drive north of Yachats are 2 additional lighthouses, the Yaquina Bay and Yaquina Head lighthouses. Crab from the docks in Waldport. Rent a kayak or canoe to explore the Alsea, or the very gentle Beaver Creek or Yachats River. Or visit one of many lakes in the Florence area where you can go fishing or rent a paddle boat, kayak or canoe. Central Oregon State Parks offer numerous places for windsurfing. Ocean charter fishing boats are available from the docks in Newport and Depoe Bay. Offers summertime kayak rentals & guided group kayaking tours on the Alsea, 8 mi. N of Yachats. White Wolf Sanctuary – Visitors welcome by appointment, 541-528-3588. Located in Tidewater, about 10 mi. E of Waldport.